Manage construction projects more efficiently with aerial imagery and drone data. Track, map, survey, inspect, and manage your worksite projects with DroneBase. Construction site aerial imagery is the innovative solution to deliver sophisticated analytics or provide a visual progress report to stakeholders. DroneBase has worked on thousands of construction sites nationwide and holds all the necessary insurance to perform the job safely and under compliance. Keep projects on track and make better decisions with visual project updates. Get highly detailed, geometrically-accurate photo representations of your worksite. Use drone imagery to generate 3D models of your site, stockpile measurements, and more. Save time and money while reducing liability with thermal imagery inspections by drone. DroneBase has been trusted at thousands of worksites across the world with professional pilots in every state and over 70 countries. We are focused on safety, standard of quality, and hassle-free operations with great customer service. Our vetted and trained pilots are available nationwide, insured, and compliant with regulations. We’ve partnered with leading analytics companies to easily integrate into your existing workflow. As the world’s trusted Drone Service Provider, we will deliver ROI-positive results that outweigh building an in-house drone program. While traditional means of collecting aerial data was working for Stockpile Reports, it became clear that there was an opportunity to create greater efficiencies in their workflow by integrating drone technology. Since partnering with DroneBase, Stockpile Reports has benefitted from a 98% decrease in time spent on site and a 400%+ cost reduction. Learn more by downloading the white paper. 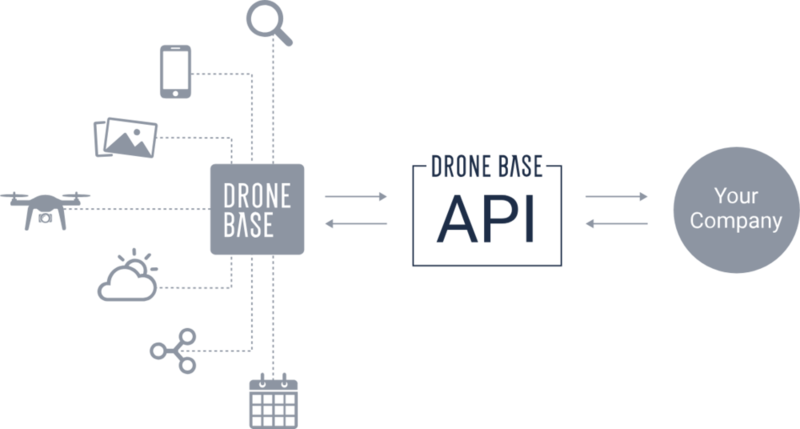 If you’re working with a large number of worksite projects or require high volumes of data, we’ve built the world’s first and most reliable drone services API just for you. Once enabled, we can send huge amounts of imagery & data directly into your workflow for a seamless experience. DroneBase operates the world’s largest network of qualified commercial drone pilots who are trained and experienced to fly for a variety of construction use cases. All drone operators are vetted and tested for professionalism and quality. We offer custom training to our pilots for clients who want even more tailored flight plans. We are permitted to fly for commercial use and insured at every job site. Depending on the package you order, we provide high-resolution aerial images, HD video clips, edited marketing videos, or the raw aerial data you need for your mapping or other analytics software. We host the images and videos in your DroneBase account so you can easily download, share with colleagues, and more. All the data is yours to own and use as you like. How do you improve efficiency and reduce costs? We take care of all pre-planning, safety checks, asset management, and quality control. As your single point of contact nationwide, DroneBase ensures a high standard of quality and fast turnaround time, every time. We also have all the necessary insurance and UAV licenses to perform commercial jobs. Working with us is much more affordable and scalable than building an in-house drone program.